Have you seen cardstock and decorative paper with a distressed effect and thought it would be great for making backgrounds for cards or scrabook pages and wondered whether it is possible to make your own? Well, it's easier to make DIY decorative background paper than you might think. You can create wonderful distressed paper to use for backgrounds to handmade cards and scrapbook pages using just ink and a plastic bag. Too good to be true? Read on and find out how! The backgroundabove has been created by using the plastic bag distressing technique. This gives an interesting backdrop to the card and provides a contrast to a stamped image or photo. There are many ways of distressing paper. Paper distressing techniques give an aged and vintage feel to paper adding lots of depth and interest to otherwise plain paper. This technique is popular with people interested in altered arts and is a great way to transform the ordinary, such as a piece of newsprint, into the extraordinary and to really add a stamp of individuality onto a project. Many paper distressing techniques involve scrunching the paper up before dabbing it with ink. The ink emphasizes the lines in the paper. There are some drawbacks with distressing paper this way. The scrunching of the paper means that it can be difficult to achieve a flat surface for stamping upon. Thicker paper and cardstock can also be difficult to scrunch effectively. A simple way to create distressed techniques is by using a plastic bag. This is quick and convenient to do, it is also the perfect solution when distressing materials which can not be scrunched.It is possible to achieve a similar effect by using a plastic bag to distress paper or cardstock. Scrunch the plastic bag into a small ball and dab it onto the ink pad. If you are using a large plastic bag, you may find it easier to cut the bag into pieces and work with a smaller piece. 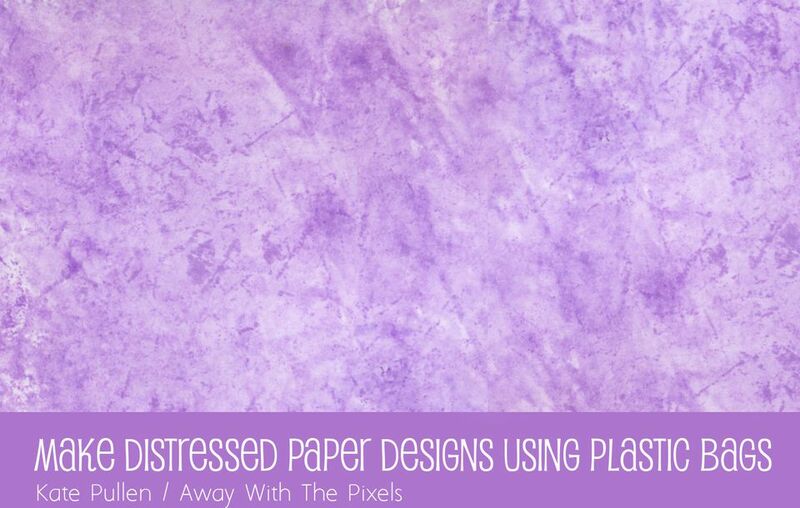 Repeatedly stamp the plastic over the paper or cardstock to build up a pattern. Keep rotating and varying the position of the plastic so you don't create repeat patterns on the page. Re-ink the plastic as required. Gently mist the paper with water to soften the ink and to encourage it to bleed. This will help to create a natural blend to the depth of colors. Use a piece of kitchen paper or tissue to dab away any excess water. Repeat if required until the desired effect is achieved. Leave the paper to one side to dry. Once it is dry you can cut the paper and add it as a background to handmade cards or to scrapbook pages. Here's an example of a card made using this simple paper distressing technique. Here are some more ideas for making your own DIY decorative backgrounds.